Despite some early gremlins with stability and memory compatibility, AMD has worked hard to make Ryzen a success, not least of all because the roadmap doesn't end with the first-generation CPUs launched in 2017. This year sees the launch of its Pinnacle Ridge 12nm 'Zen+' CPU models, which will be staggered like in 2017, with two octa-core Ryzen 7s and two hexa-core Ryzen 5s launching today, followed by additional mainstream offerings plus 2nd Gen HEDT Threadripper later this year. Today we're looking at the eight-core Ryzen 7 2700X and six-core Ryzen 5 2600X, although their non X-edition counterparts (both with 65W TDPs and focused on efficiency more than performance) will be readily available from today as well. AMD has been fairly tight-lipped about which exact models we can expect in addition to these four, but its Senior Vice President and General Manager Jim Anderson has stated that the total number of CPUs would be similar to what we saw in 2017, so we're expecting additional Ryzen 5s and Ryzen 3s further down the line. At first glance, there's a glaring omission at the top of the stack: a true replacement for the Ryzen 7 1800X. AMD said this was for several reasons. Firstly, it noted the small gap in performance between the Ryzen 7 1700X and Ryzen 7 1800X and has simply amalgamated the two CPUs to condense the stack at the top end. Secondly, the Ryzen 7 2700X is much faster than both in terms of frequencies, so it made more sense to cut the Ryzen 7 range from three CPUs to two, offering a slightly pokier non X-series model in the form of the Ryzen 7 2700. As such, the Ryzen 7 2700X acts as the Ryzen 7 1800X's replacement currently, but AMD did not explicitly rule out something eventually superseding the Ryzen 7 2700X. If you've been living on a desert island for the last few months, we'll fill you in with a few of the basic details. Firstly, compatibility is maintained with older AM4 motherboards, so you can use the new CPUs in existing motherboards, although you'll need a BIOS update in order to do so and you might not be able to tap into all the new features, which we'll get to in a minute. If you are buying an older board that's already had its firmware updated, you can expect to see a 'Ryzen Desktop 2000 Ready' sticker on the box. Even if it isn't updated, AMD is able to send out temporary bootkits with older CPUs that will allow you to perform the necessary BIOS update. First-gen CPUs work in motherboards that sport the new X470 chipset that's also launching today, and AMD has pledged to support AM4 through 2020 as well. The Ryzen 7 2700X has a 105W TDP and comes with the new Wraith Prism stock cooler, which has a claimed noise rating of 29 dB(A) and RGB logo and ring illumination that is addressable. It also has a fan mode switch and better compatibility with small form factor motherboards and tall memory modules. The Ryzen 5 2600X, with a 95W TDP, drops to a Wraith Spire cooler. The main feature set of the chipset remains relatively unchanged from X370, but all 400-series chipsets will support AMD's new StoreMI technology, a software solution that effectively caches frequently used data from slower drives (i.e. mechanical ones) onto faster ones (i.e. SSDs). AMD says it 'can also use up to 2GB of RAM as a last-level cache for ultra-fast data'. You can think of it as similar to Intel Optane but more open since it doesn't require specific Intel SSDs to function, though that means it won't work at as deep a level and is unlikely to be quite as effective. However, certain chipsets will be barred from accessing the full range of new features, as you can see in the table below. In addition to lacking power delivery improvements, X370 boards won't support Precision Boost Overdrive, a new feature to be added to Ryzen Master at a later date that offers additional boosting above the new algorithms. That said, Extended Frequency Range 2 (XFR 2) - part of AMD's new boosting algorithm - is supported on X370 motherboards as well as future chipset boards such as B450 and Z490 (we haven't actually heard anything about the latter yet, but it's an interesting tease from this table provided by Gigabyte). 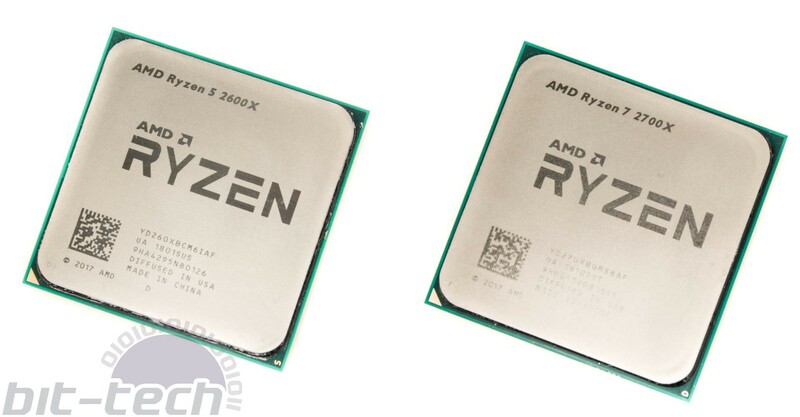 Poor old B350 and lower chipsets will not support XFR 2 or Precision Boost Overdrive, and as you'll see in the graphs later on, this will likely mean it's not worth upgrading to 2nd Gen Ryzen CPUs with anything other than an X370 or newer chipset. Apart from the higher frequencies and new boosting algorithms, the new CPUs don't differ too much from their predecessors. They use a 12nm as opposed to a 14nm manufacturing process, and AMD has lowered the latency of all three cache levels and DRAM, with the biggest improvement coming with the L2 cache at a latency drop of 34 percent. These latency improvements are made at a low software level rather than the hardware level, but as it leverages characteristics specific to the newer 12nm process, it cannot be backported to older 14nm first-generation Ryzen parts. IPC is estimated to have increased by a mere three percent, so many of the gains will come from increased clock speeds rather than architectural changes, and these clock speed gains again come as a result of the better voltage-frequency curve permitted by moving to 12nm. AMD continues to use die metallisation and premium indium alloy-soldered heatspreaders - there's no thermal paste here. However, the cache amounts remain the same at 3MB L2 and 16MB L3 for the two hexa-core CPUs and an extra 1MB L2 cache for the octa-cores. There are also no core count increases, so you'd be forgiven for thinking that these improvements probably don't amount to much.